Dimensions 0.25 by 4.25 by 5.50 in. Amazon.com description: Product Description: This easy-to-follow, authoritative book will prepare students away from home for the first time and facing new temptations with unanticipated but serious consequences. Writing in layman s terms, San Marcos attorney (and college rugby coach) Scot Courtney de-mystifies the law while offering useful tips: what to say when an officer pulls you over, how to handle a cop who shows up at your party and whether you should try those stupid human tricks on the side of the road if you've been stopped for drinking and driving. 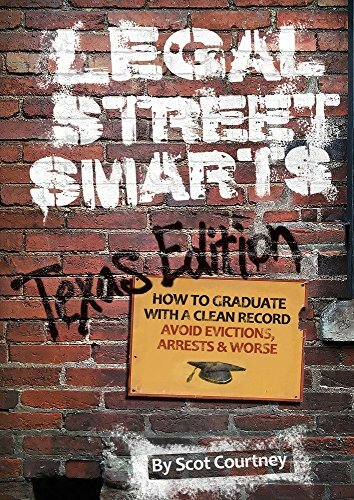 With this legal survival guide, a college student no longer need rely on the dubious advice of the dormitory/frat house know-it-all when things begin to careen off the rails. The book shows how campus pranks and careless behavior can lead to felony charges that could follow youths the rest of their lives. Courtney spells out when horseplay becomes hazing, when seduction becomes sexual assault. About: This easy-to-follow, authoritative book will prepare students away from home for the first time and facing new temptations with unanticipated but serious consequences.